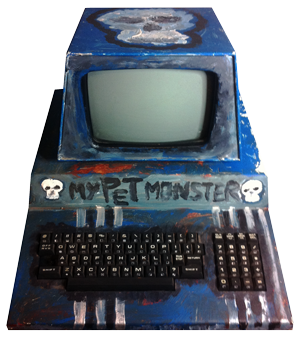 This is My Pet Monster, I found him abandoned on the street — left out in the rain, sometime in 2001. He was pretty scratched up and started to rust.. which after a little scrubbing (and some beer for me) he ended up getting a paint job. There are a lot of Pet Enthusiasts out there who will cry when they see the paint job. But after a little cleaning, prodding and solder (recently) he turned on! Now, looking at the tag on the left it says 2001-8. I live in Canada, this machine was found in Toronto. I also know after pulling out the motherboard — a sticker says : Ryerson Polytechnical College (which is now Ryerson University). But the exterior is not a PET 2001 Series, it has no tape drive and has the graphical keyboard. But all pictures I’ve seen of other pets that are the 2001 series after the Chicklet Keyboard have a different motherboard. Is it weird or …1023 bytes free, seem strange? 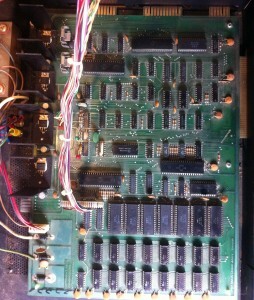 — After some chats with Mike Stein (TPUG Email List), I’ve swapped around 2114 ram chips, to find the bad one(s). I basically got it down to two chips, then he suggested switching around the video ram, one at a time. If you get garbage on the screen, then the chip is bad. In the end both chips are bad. So I get ~6k of ram working :). — Arg as I was writing this, the PET just shut down. And its not coming back. Noo…. CH(A) (TOP) is Pin 1 off of the 2114 SRAM in the first bank. Then goes this post boot. Well, it’s got a pulse.. hah. I think it’s actually the display system itself. The monitor is not powering up or showing the signs when it’s powered off.. The Fading white dot.. I really wish this was a ROM problem, messing with CRT’s is deadly if you don’t discharge them properly. I knew a guy at a workshop who died form one of the massive TV’s that were built into furniture. So.. Hmm.. It looks like the tube doesn’t power up at all. 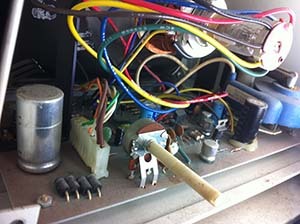 With an induction amplifier, aiming it at ANY CRT will be noisy as hell. My 1084 monitor generates a lot of noise, and a PET monitor should be loud… not a peep. I do not want to open the back of the screen.. eek. As you can see below, everything looks ok.. nothing obvious.. This last pic is with the light off, to see that the tube is actually got something going on.. The tube is lit when the power is on, just not enough to show something. I was thinking about making a modem file, or hack part of Darkstar BBS to work as Telnet BBS. 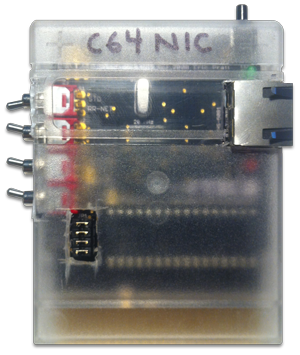 When I started working with this device, I noticed Leif Bloomquist was working on a network game for the C64. I began thinking of trying to test out burning some ROM’s for this device. I pulled out my trusty EEPROM burner and found out — my laptop doesn’t have a parallel port! Shhessh. I tried various LPT-USB adapters and nothing works. 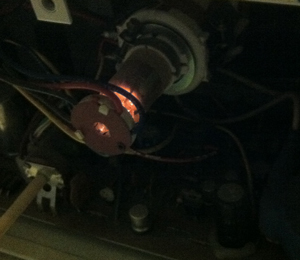 Hmm, maybe I’ll bother someone with a more modern EEPROM burner. But the idea of a network game seems pretty awesome, I’ve noticed Vice has a networking config… hmm. Anyways, maybe a mini-mmo type dungeon crawl game might be fun. 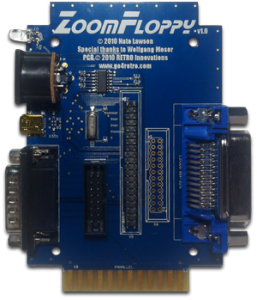 Zoom Floppy is a USB to Anything Commodore adapter. I can remember having a X1541, a 386 some a really old ISA LPT port adapter and hours of fiddling, copying and pain with Star Commander. After the setup got hooked up, I ended up slapping an NE2000 and a DOS based TCPIP Stack to transfer files off the disks. 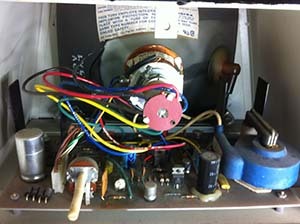 The Hacked up 1451 cable always had its issues too. Move ahead to 2010+ and you have a Zoom Floppy. It was 5 minutes of setup and disk transfers were happening. It’s a great piece of equipment. One of the great other benefits is for the rest of us that have IEEE Devices. I have a SFD1001, CBM8050 and an MSD SD-2. It was pretty impressive to hookup these drives just as easily as an IEC 1541. Backing up these IEEE devices is awesome, but accessing them without a BUS card on a PC is amazing. I noticed some weirdness with the dual drive units, I could read off of Drive 0 but not off of 1. I am sure I just need to either update my software or I’m doing something wrong. But flipping disks between drives is not an issue. This segment is from the opening of Doctor Who, (I think Tom Baker :)) and slightly tweaked to allow it to loop better. The output of GIF2C64, is generally just RAW data or a text file with a long stream of .byte(s). I’ve added some ASM output options like a mini player for animated gif’s (in this example) and scrolling code for images larger than the screen of the C64. There were a few video’s out there, in the 80’s that someone made — one of them was of HE-MAN. It was black and white pixels represented by the standard font map. Seeing that video made me a little crazy for video on the C64, even much later I was working in DPaint on the Amiga with ambitions to get the anims over to the C64. I can also remember the first digitized audio I ever heard on the C64, I think it was “stay a while, stay forever!”.. the next was “Born in the USA” by Bruce Springsteen. Dirk Dead: Down the street from my house (when I was very young), there was a Dragon’s Lair arcade game. I have always loved that game. I ended up with the real arcade laser disk and a copy of it on DVD. When I got the C64 game, it was a million disks and there were always errors on the various disks (or failed copy protection). But when the C64 game ran, I was thinking *what? this isn’t Dragons Lair!*.. then the first few sequences would run… then crash. This was created by GIF2C64 a C# application I am working on. 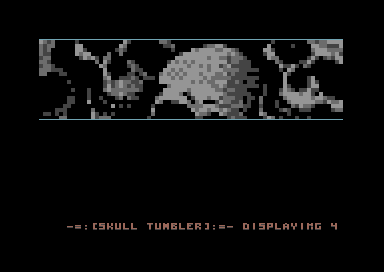 Skull Tumbler v1-4 : Coding, GFX and Music by Wolfgang Bochar. This is a long time coming, I’ve managed to the IRQ timing correct, 16 sprite blockers to give the window effect and no jitters. Works on NTSC and PAL machines, though PAL is a little slower on the playback. I used to have closer to 18 rows of text graphics scrolling — but when combined with the audio, sprites and x-y scrolling in the two raster areas.. it got quite jittery. There is only so much raster time to render the image, so I started running frame 0 half image then frame 1 lower half — then the Y scrolling started to look jumpy with the timing. This version has a smaller window, but I like the simple layout better (but full screen video is great too). Something to work at in the future. I am pretty happy with this, it is the cleanest and most complex IRQ coding I’ve every done. I’d like to thank the crew at Covert Bitops for the ASM Notes and GoatTracker (which I composed the music on), The KickAss Assembler and the Kick IDE guys (makes Dev so much faster), Oliver Achten and Jens Schönfeld for the MMC Replay (makes testing on a real C64 fast and easy) and Takeshi Yano (for all the C64 chats over the years). The Source graphic (and any video data on this site) was generated by GIF2C64 (C# application), that takes gifs (animated too) and generates custom charsets. I haven’t got all the bugs out, but after alpha is finished I’ll post a beta version for external testing. 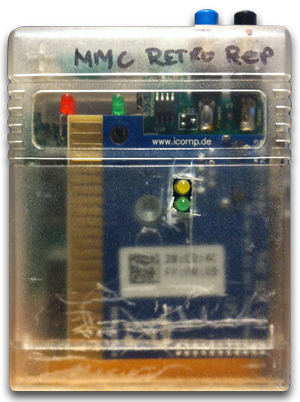 MMC Replay gets a powerup 🙂 I ordered a batch of equipment, from www.icomp.de: 2 RRNET3’s and a Chameleon docking station. My Chameleon, for some reason died! And after a few days of back and forth emails with Jens, it got shipped back to its maker. The other RRNET3 got installed in my MMC Replay (on the left). I’ve almost lost a few fingers in the process of cutting through the plastic to make the LED’s and NIC port accessible. I’ve had access to proper tools to make plastic molds and cart cases, but the hack method definitely is a little more pleasurable. When I got this cart, I had one of those Back to the Future moments — where I wished I could send this guy back to myself circa ’84. Just be able to load everything you have on an SD card is awesome. I like doing dev work with it, but the SD card I was using was starting to warp a bit from continuous inserting. 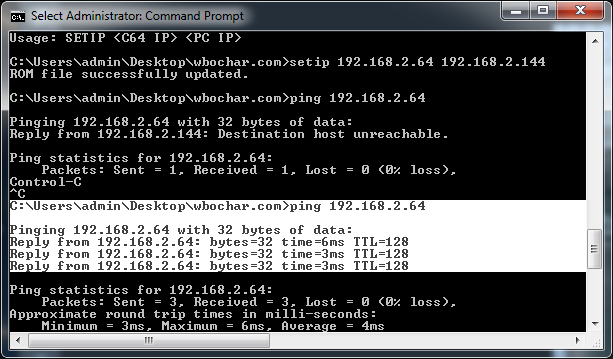 So, move over SD Card and use NIC/TCPIP. 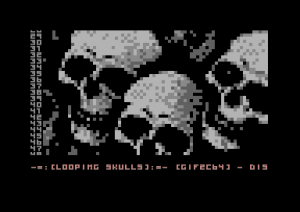 This is my most recent output from my GIF2C64 conversion utility. I made an image in photoshop, that would appear seemless when scrolled. 4 colour gif, converted to a custom multi-colour font, basically dividing the character into quadrants with each possible combination of patterns. The output software also handles font compression, to strip out excess unused patterns, which is how the Letters have been retained in the fontmap. 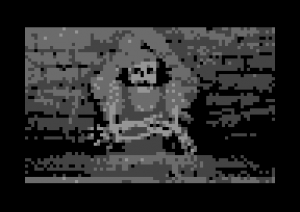 Gif2C64 also can take animated gifs, which with more frames in the video the less space is available for letters. I’ll try to post an example of video later..
At some point everyone thinks about making their own computer, I’ve always wanted to make one. The C128X was supposed to be used for a commodore themed website, never got down to making it. As my electronics skills are mediocre at best, I doubt that I could make a computer on my own — but I can at least design the look of one. I always liked the the 128D’s design, the pull out keyboard and the built in floppy. The A2000 as well I always liked especially for the front facing joystick and keyboard ports. The A2000 was a barn though, you could hide an entire other computer in there with room to spare (if you had the AT addon then you did have two). Another PSD, this time of a Commodore 1571 disk drive. You can get the file here: Commodore 1571. I remember getting a C128, which replaced the first C64 we had. My father managed to talk to Jim Butterfield, who arranged the original C64 purchase — first generation hardware coupled with a white 1541. It’s funny, as that original C64 was never traded away.. unlike that C128 which somehow I got an A500 for. Weird. 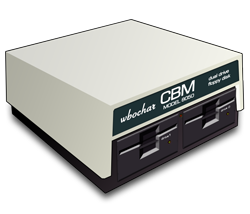 My BBS in the day had one of these, an 8250 and a SFD1001 attached to a BUS Card with a pile of 1541’s. The grade school I was in, had 4 pets sharing an 8050. That was the first network I noticed, then a pair of ICON’s showed up. I’ve also included with the ICO files the config file that you can use to make these a disk icon. These are nice to replace the SD cards default disk icon, great for people with MMC replays or Turbo Chameleon 64’s. Note: The Commodore PSD uses Adobe Photoshop CC’s 3D capabilities, the other file is a flat bitmap. KickAss IDE, is a great setup. On my Win7 machine, I really enjoy using it. After years of mixed tools for c64 dev, having a full IDE is amazing. 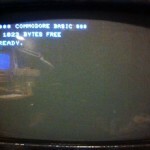 If you are into doing some c64 coding on a windows machine, pick it up! It’s too bad there isn’t a OSX port, I ended up using the Kick Assembler with UltraEdit on OSX.